In the pages of biology, we learn that DNA has two strands – a double helix with 46 chromosomes. The 10 components of the physical DNA are etheric strands that we call “junk DNA”. Scientists still haven’t found what our “junk DNA” purpose is. However, theologians may already know the answer to what it’s about to be discovered. Scientists all over the world united to work together in finding if God truly exists. And when they did find a link to go after, it lead them to climbing a huge mountain. But upon reaching the top of the mountain, what they found was a mere shock – theologians were already ages before them, waiting for them to come. “Junk DNA” is DNA in a standby mode, holding information from the Source, waiting to be put in action (activated). “Junk DNA” serves a vital purpose. What happens when you activate your “junk DNA” encompassing only 3% of your DNA? Looking this from a ground perspective your DNA will covert protein. But when we take a look from a spiritual perspective, you are connecting with your higher self and your divine purpose. You are no longer attached to fear, suffering, overwhelm and internal conflicts. How to connect with your higher self? Our whole life is comprised of frequency to the smallest atom in the universe. Your vibrational frequency is defined by your DNA activation. Look at it this way – if you are set in a low frequency mode, this will bring you conflicts both internally and with others, feeling limited and overwhelmed. But when you increase your frequency you become a magnet for people, situations and events that you couldn’t attract before. Being in low frequency, you’re inclined to stay in the ego and make decisions more from the mind than your intuition. The ego is a playing ground for conflicts ready to torture your soul. In a higher frequency, you are able to see the problems and know how to solve them. Something you’re deprived from achieving while in a low frequency mode. 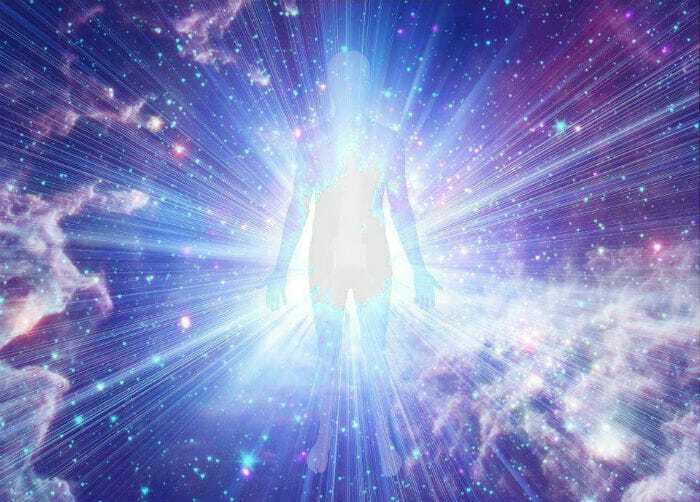 DNA activation presents a chance to embody your higher self, become synchronised one with your higher self and align with your divine intentions. However, a big part of humanity is still facing issues when it comes down to connecting with your higher self. Why can’t we connect with our higher self? In Flower of Life, Drunvalo Melchizedek tells about a grandiose cataclysm that occured on Earth nearly 13, 000 years ago. Shifting of the poles, the melting of the Antarctic ice cap and temporary demolition of Earth’s magnetic field caused tremendous harm to humans. Melchizedek explains the event led to an abrupt drop from the higher levels of consciousness to the lower levels of consciousness. This unravels why humanity lost connection to its higher self. The result was disastrous. In order for humans to adapt, they started breathing prana through the nose and mouth ignoring the pineal gland. The reverse change in breathing through the nose and mouth made humans change their perspective on how they see the world – separating things from the point of good and evil. Duality consciousness was born. The downgrade in consciousness was caused by a chromosome failure that deprived us from experiencing the higher levels of consciousness and being stuck in the endless circle of mortality and death. 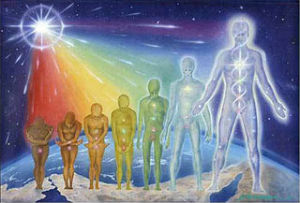 In order to revive the connection with our higher selves, we need to repair our DNA to the state it was before the cataclysm event. Let’s not forget that DNA activation plays a vital role for the Ascension and spiritual growth of humanity. How it meant to be before that? Before the cataclysm that hit Earth, everything was programmed for us to be able to achieve higher consciousness within one given life. 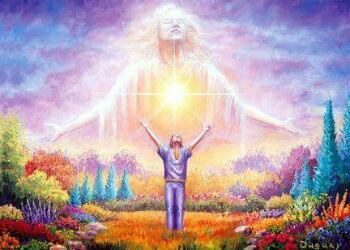 Due to the abrupt changes on Earth we could no longer embody our higher self or ascend. We got stuck in the never-ending cycle of birth and death. Reincarnation was not part of how our evolution plan should have unfolded. The sudden changes of Earth’s magnetic field led to reverential changes in our own DNA system. We simply forgot how to connect with our higher self. Before the occurred natural disaster, human species could embody 12 dimensions of consciousness in a single existence. It was natural for us to activate DNA strands four, five and six – matching chakras 4, 5 and 6 by the age of 12. Strand seven, eight & nine matching chakras 7,8 & 9 by the age of 22. Strands ten, eleven & twelve matching 10,11 & 12 by the age of 33. Ultimately, strands thirteen, fourteen & fifteen matching chakras 13, 14 & 15 by the age of 44. The majority of people have only three, maximum three-and-a-half DNA strands activated indicating you are given a chance to experience no more than three dimensions of consciousness and finite spiritual progress. How many dimensions the universe has? The universe holds 15 dimensions. These 15 dimensions are divided in 5 harmonic universes called HU. We’re currently inhabiting HU-1 which holds dimensions 1, 2 &3 and governs our physical body. HU-2 is responsible for dimensions 4, 5 & 6 and governs our soul. HU-3 is responsible for dimensions 7, 8 & 9 and governs our divine spirit (oversoul). HU-4 is responsible for dimensions 10, 11 & 12 and governs our divine teacher or also referred as our Christ Consciousness. 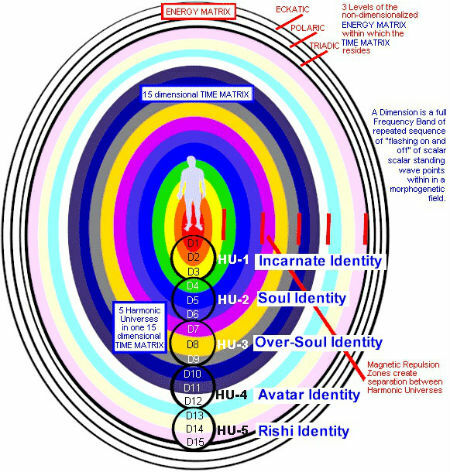 HU-5 is responsible for dimensions 13,14 & 15 which is our Hindu sage (Rishi Identity). Spiritual teachers repeat these terms when explaining to us what enlightenment is and how to achieve it. With DNA activation, all these separated parts are gathered and combined bringing us in a state of expiation with the Source. This is how it meant to expand your consciousness. 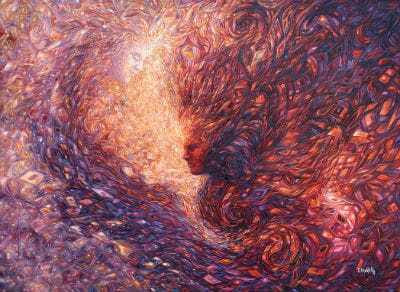 Incarnating your higher self you are making a dimensional shift. Currently, our planet and we are in the middle of a rare cosmic event called stellar activation cycle, happening every 26,000,556 years. Stellar activation cycles are significant because they can boost our natural ascension process. Ascension can only happen when DNA is activated. DNA activation is a way of restoring the natural process of ascension with the help of sacred geometry. An angelic human has a potential encoded in its DNA architecture to incarnate 12 strand diamond sun DNA template. Indigo children can incarnate 12, 24 or 48 strands or 12, 24 or 48 dimensions of consciousness. Last but not least, activating all your DNA strands can transform your life from being in the ego, where all innate animal instincts reside to seeing the world through the eyes of your higher self and being able to fulfill your purpose. Sources: A Modern Mystery School – Who Called Off The Apocalypse? Thanks for this article. First of all you make some good points. I’m also glad that you read melchizedek. I always thought I was one of the few to read that “weird” stuff. I do have to point out some erroneous facts you stated. Although it is highly accurate to say that at some point in history human kind lost their connection with their higher self (PARTIALLY! ), it is not due to a chromosome ‘failure’.. It was well intended God’s plan, to enhance it. Humans can’t live without a connection to a higher plane (neither can animals or insects, plants nor mother earth)..
What was highly likely to happen at this stage in human history is that the event triggered massive vulcano eruptions covering most of the planet’s atmosphere in ash. As you know our lovely bright star (The Sun) is our true connection to our higher self, the sun was partially obscured (i’m not going to go down into details, if you are able to connect to your higher self you can find this out by yourself). I’m kinda surprised. I find myself constantly reading things that are burried and hardly ever anyone reads about them, so I don’t usually expect someone to know about them. Although I sometimes contradict myself, I too believe that everything that occurs, either good or bad, has been well-planned by God. We just need to raise our vibration to understand that. We are here to constantly learn. I am grateful that you pinpoint the errors of my writing. The last thing wanted is to confuse the reader. My goal is to raise the awareness about what we don’t know.